Ugh, desk jobs. I mean, we hate to complain because having a steady income is awesome and all… It’s just that working is kind of a pain in the neck. Literally. What we’re trying to say is, if you sit behind a desk all day, your neck and back are probably screaming for some relief. Trust me, I know. 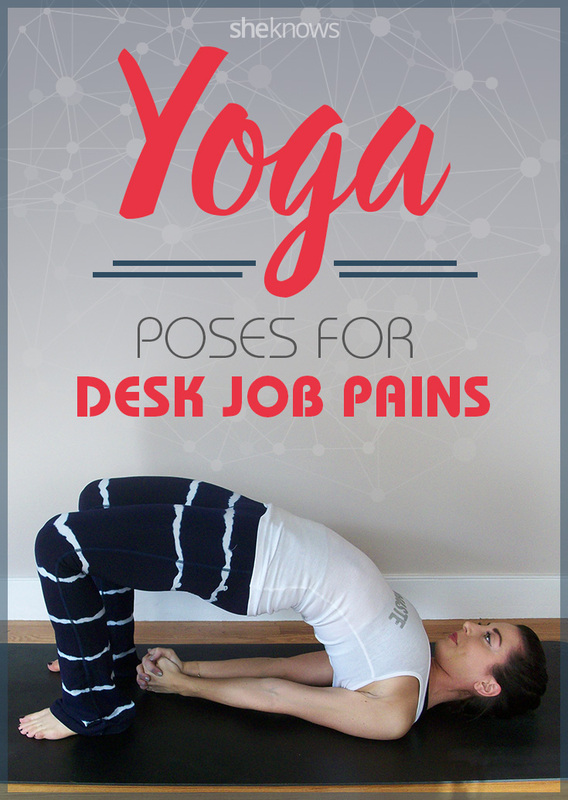 As someone who works a regular 9 a.m. to 5 p.m., I’m definitely not immune to the aches and knots that come along with constantly sitting behind a computer — even if I am a die-hard yogi. From headaches to pain in the neck, shoulders, back, feet and eyes, spending 40-plus hours behind a desk every week can definitely lead to a bit of pain and agony. “Being chained to your desk starves your extremities of blood, oxygen, and other fluids, resulting in tight muscles and stiff joints,” wrote Paige Greenfield. But don’t worry, I’m not here to tell you to quit your day job or invest in a stand-up desk (although that certainly could help). I am here, however, to offer some other possible solutions and relief for any stress and tension you’re feeling as a result of working. Bielkus suggests practicing yoga postures that target areas of tension, which can be an effective way to re-align the spine after sitting behind a desk all day. As an added bonus, Bielkus notes that the mind-body practice also helps address the damaging stress of a high-pressure job by calming the mind and quieting racing thought patterns. So before you go grabbing some ibuprofen to relieve you of stiff joints and pain, try taking a couple minutes each day to pop a few of these yoga poses that Zabel recommends instead. If you’ve only got time for one yoga pose per day, make it Down Dog. This pose stretches and strengthens many parts of the body, as well as reduces tension in the shoulders, relaxes the neck and gets more blood flowing to the brain. This pose is also great for stretching out those legs that have been sitting all day and the wrists and hands, which may become sore from hours at typing away on a keyboard. From Mountain Pose (standing position), reach your hands down to the floor, bending your knees if need be. Walk your hands out about three to four feet in front of your toes. Pushing into your palms, lift your hips up toward the sky and press back into your heels, trying to get them flat to the ground. Keep your gaze toward your legs and continue pressing your chest toward your thighs to create a nice flat back. Cobra and Up Dog help improve posture by lengthening the spine and opening up the chest, which counteracts sitting hunched over all day. These two poses also help strengthen the spine, arms and wrists; stretch the chest and lungs, shoulders and abdomen; firm the buttocks; and stimulate abdominal organs. 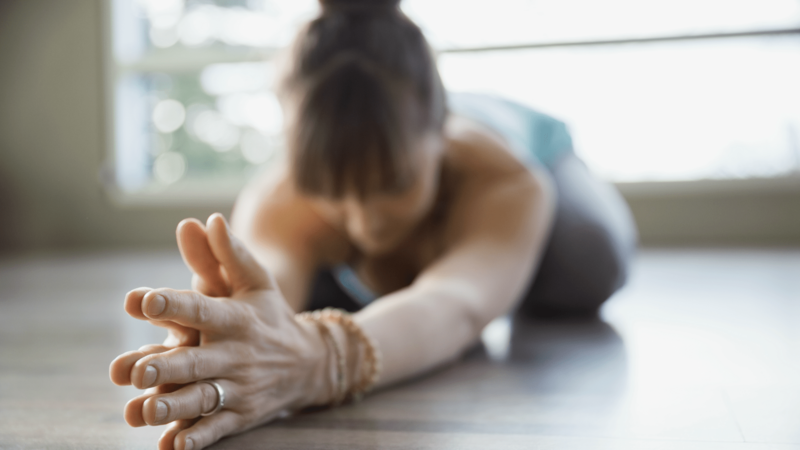 Begin by laying down on your stomach, or lower your body down towards the ground through Chatturanga, and then firmly press your palms into your mat alongside your chest. Roll your shoulders back and start to lift your chest up and off the mat, while keeping your hips firmly planted on the floor, keeping a slight bend in the elbows to avoid injuries. Remain here in Cobra, or for a deeper stretch, begin to straighten your arms as you lift your thighs and knees off the ground, pressing into the palms and tops of the feet, and lift your gaze up towards the sky, finding Upward Facing Dog. Extended Side Angle strengthens and stretches the legs, knees and ankles, which is certainly needed after sitting all day. This pose also stretches the groin, spine, waist, chest and lungs and shoulders, as well as stimulates the abdominal organs and increases stamina. Starting from Warrior II pose, bring your front forearm to gently rest along the top of your front thigh, allowing it to press into your leg as you turn your chest to lift towards the sky, creating space between your supporting shoulder and head. Pushing through your back foot, so that all five toes are pressing evenly into the ground, keep the back leg extended straight while the front knee stays bent. To stretch a little deeper, reach your front hand down towards the ground, while you continue to reach your back arm up and overhead. In this variation, the front hand can either come to the inside of the front foot, allowing the shoulder to press firmly into the knee, or bring the arm to the outside of the front foot to make the stretch a little less intense. Bridge Pose strengthens the entire backside, including upper back, glutes and hamstrings, which can become tight from sitting all day. Lying flat on your back, arms by your sides, bend your knees and plant your feet on the floor, bringing your heels as close to your bottom as you can. With your palms pressing into the floor, lift your hips off the ground and up towards the sky. Hold here for four to eight breaths, continuing to push through the feet and lifting the hips as high as you can, or choose to roll your shoulder blades underneath you, clasping your hands together to form a fist. When releasing, gently release your hands and slowly roll your spine back down to the floor, one vertebra at a time. Child’s Pose helps to focus your mind, open the shoulders and hips and bring you inward by grounding the third eye. Begin in Table Top position, on all fours, and then separate your knees about mat-width distance apart, connect your big toes together and begin to sink your hips back towards your heels. Take a deep inhale and as you exhale, lay your torso down between your thighs, so that you are nestling between your legs. Extend your arms out in front of you, continuing to reach through the fingertips, and gently release your forehead to the floor, relaxing here for one to three minutes. Savasana helps to release tension in the body and mind, and relieve stress and anger, bringing the body to a more balanced and clear state. Lying flat on your back, arms by your side, legs extended out in front of you, allow your palms to face up to the sky and feet to turn out to the opposite sides of the room. Close your eyes and release any tension from your hands, feet, face and body. Try to bring your focus back to your breath, taking deep inhales and exhales through the nose. Lay here for a few minutes, thanking your mind and body for all the hard work it did throughout the day.